Yes you can make ice-cream at home without ice-cream maker with very simple ingredients usually available at home. It tastes really delicious and very to make. 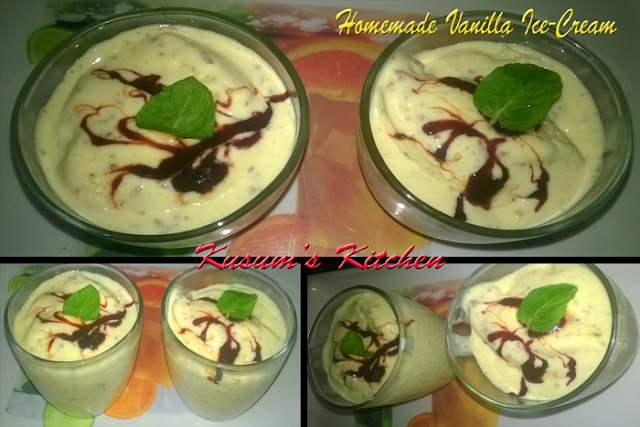 Let's see how to make Vanilla ice-cream at home. Full cream milk: 750 ml. Take two table spoon of custard powder in a cup and add 3-4 tablespoon of lukewarm milk in it to make a thin paste. Take a heavy bottom pan and heat milk in it and add 3 table spoons of sugar. Cook until milk remains half its quantity. Now slowly-2 add custard paste into milk, mix well and cook on slow flame. Keep stirring it until the milk reduces and you get a thick consistency. Custard is ready. Take it out in a bowl. Let it cool. For making ice-cream; the custard should be chilled. So let it cool well. You can refrigerate it after it comes to room temperature. Take chilled fresh cream in a bowl, add 1 table spoon caster sugar and start whipping it. Whip it continuously for 2-3 minutes You can use electric blender, hand blender to whip it or simply use a fork to whip it. Now add whipped cream, raisins into custard and beat it with a fork for 2-3 minutes. Now add grated chocolate and mix well. 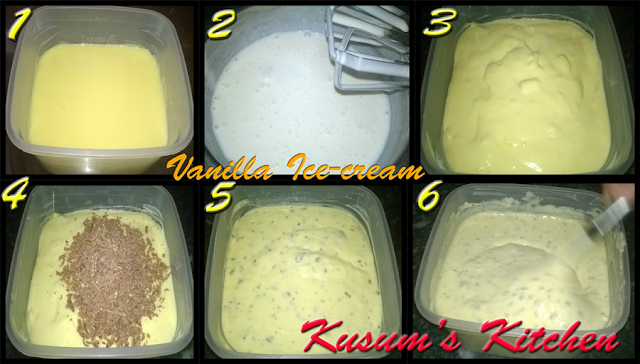 Transfer this ice-cream mixture into an air tight container and refrigerate it. After 2 hours get the ice-cream container out of fridge and again beat it using a fork until you see very small air bubbles. Again refrigerate it and with 5-6 hours. Your delicious ice-cream will be ready. Enjoy. And give your feedback in comments. एक कप में 2 बड़े चम्मच कस्टर्ड पाउडर लेकर गुनगुना (बहुत हल्का गरम) दूध डाले और अच्छे से मिलाकर पतला मिश्रण तैयार करे. एक भरी तले का बर्तन लेकर उसमे दूध गरम करे और और 3 बड़े चम्मच चीनी मिलाये. दूध को तब तक पकाए जब तक गाडा होकर आधा न रह जाये. अब दूध में धीरे-2 कस्टर्ड का बनाया हुआ मिश्रण डाले और अच्छे से मिलाये और आंच कम कर दे. इसे तब तक हिलाते हुए पकाए जब तक दूध अच्छे से गाड़ा न हो जाये. कस्टर्ड तैयार है. तैयार कस्टर्ड को एक कटोरे में निकाल ले. इसे ठंडा होने के लिए रख दे. 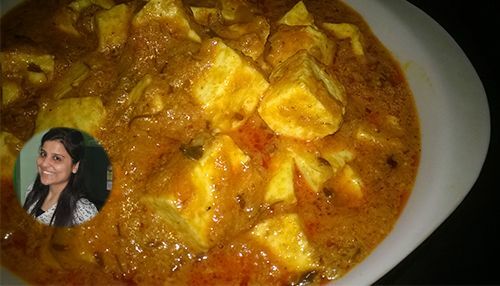 Ice-cream बनाने के लिए कस्टर्ड एकदम ठंडा होना चाहिए. आप चाहे तो थोडा ठंडा होने पर इसे फ्रिज में भी रख सकते है. एक कटोरे में ठंडी ताज़ा क्रीम लेकर उसमे एक बड़ी चम्मच पिसी हुई चीनी मिलाये और क्रीम को व्हिप करे. क्रीम को लगातार चलाते हुए 2-3 मिनट व्हिप करे. क्रीम व्हिप करने के लिए आप इलेक्ट्रिक ब्लेंडर, हैण्ड ब्लेंडर या फिर फोर्क का उसे कर सकते है. अब व्हिप की हुई क्रीम को ठन्डे कस्टर्ड में मिलाये और 2-3 मिनट क लिए फोर्क से बीट करे. अब कद्दूकस की हुई चॉकलेट मिलये और अच्छे से मिलाये. Ice-cream के मिश्रण को एक एयर-टाइट कंटेनर में डाले और फ्रिज में रखे. 2 घंटो बाद Ice-cream कंटेनर को फ्रिज से बाहर निकले और एक फोर्क की मदद से Ice-cream को तब तक बीट करे जब तक छोटे-2 बुलबुले नजर आने लग जाये. अब 5-6 घंटो के लिए Ice-cream को फिर से फ्रिज में रखे. बहुत स्वादिष्ट Ice-cream तैयार है. इसका आनंद ले और अपने अनुभव comments में लिखे. You can use any flavor of custard powder. You can add any of your favorite nuts(almonds,cashew-nuts). Any chocolate can be used in this ice-cream. While making custard paste just make sure that the milk is lukewarm. Otherwise if the milk is too hot then lumps will be formed. While mixing custard paste in milk keep stirring the milk continuously and mix well. Cook custard on slow flame. कस्टर्ड का कोई भी फ्लेवर प्रयोग किया जा सकता है. अपनी पसंद अनुसार सूखे मेवे(बादाम, काजू) प्रयोग किये जा सकते है. कोई भी चॉकलेट कद्दूकस करके प्रयोग की जा सकती है. कस्टर्ड पेस्ट बनाते समय हमेशा गुनगुना (बहुत हल्का गरम)दूध ही प्रयोग करे. यदि दूध बहुत ज्यादा गरम हुआ तो गुठलिया बन जाएगी. दूध में कस्टर्ड का मिश्रण मिलाते समय दूध को लगातार चलते रहे और अच्छे से मिलाये. कस्टर्ड को धीमी आंच पर पकाए.